If you own a bakery, then you already know the importance of packaging boxes for bakery items. A personalised bakery packaging box will not only ensure it’s safety while your product is being transported but will also retain its freshness to give your customer the experience that he’d expect. Bakery boxes are made of different types of materials but most used material is cardboard. Being light in weight to be easily carried and strong enough to support items inside, cardboard is the choice of many bakery outlets around the world. But some people would also go with other packaging materials like plastic and foil. What Are The Benefits Of Custom Packaging Boxes? The main purposes of packaging box for food items is the to keeps products safe from outside influence and keep them integrated while they go a long way to reach their destination as well as providing information of the ingredients used in manufacturing process. You have baked a delicious item and are now ready to present your item to potential buyers. But how are you going to prevent your item from environmental damage or loosing its freshness? That’s where packaging boxes come to your help. They will not only protect your product form germs, bacteria or pollution but will also provide easy carriage of your product to buyer’s location. The rigidity of the box will also protect your product from physical damage while being transported. Packaging boxes play an imminent role in marketing and brand awareness. Nicely placed logo of your business will tell the customers of where the product came from and vital information of your ingredients and business will help your customers to get the idea of your product and means to get in touch with you. 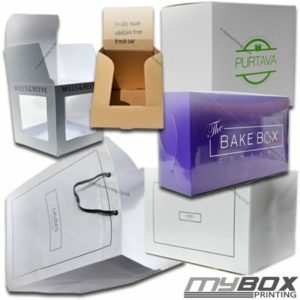 Why Custom Bakery Boxes From My Box Printing Are Better? We are a leader when it comes to packaging boxes suppliers in UK and Europe. Manufactured in modernly equipped production facility, our bakery boxes are environment friendly and are made of 100% recycled material in compliance of major food safety laws. When you order packaging boxes from us, be sure that you will get the best rate that you can get for a rather sophisticated and elegant shipment. If you want to place an order or want to get a quote, we will be of total assistance. Just fill out your product information in our request a quote form and our sales department will be in touch with you shortly. We have a history of facilitating our clients in every manner. That’s why we have announced a 10% discount on our custom bakery packaging boxes. Remember, this promotion is for Christmas only and will not last long. So rush now to get benefits from this tremendous offer.